Our passionfruits vines had given us abundance of fruits last season... about 100-150 fruits (my estimation!!). Gave some away to friends and neighbours. The remaining .... we just freeze them in small plastic packets and bottles. Beat the egg yolks and sugar... using electric mixer until its creamy. Bring milk to boil and then remove from heat. Gradually whisk the hot milk into the creamy egg-sugar mixture. Return to heat and stir over low heat until mixture thickened slightly (without boiling). Transfer into a container and leave it to cool. Place Gladwrap over the hot mixture to avoid 'skin' forming. Place in the refrigerator until cold. 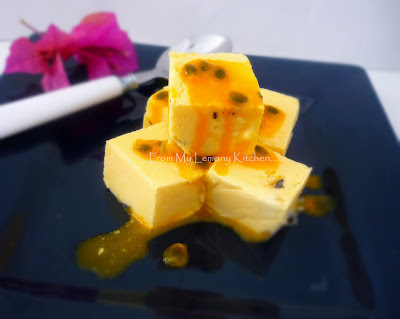 Stir in passionfruit pulps and thickened cream. Pour mixture into a suitable container, cover and freeze for 3 hours or until almost set. Beat coarsely the 'nearly' set ice-cream again until smooth. Return to the container and freeze it until firm. 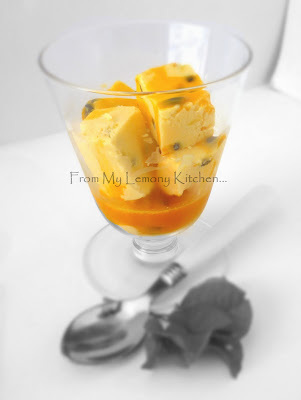 Passion fruit ice cream sounds really good to me! Wow i have to say i love what "Miss E" Has done with the background.... Absoulutly Wonderful! !